Our Conference Convener, Tia Hughes, and her team will begin plans this month for #FOTA 2018 Conference to be held at the Renaissance at Seaworld, Orlando, October 26-27. The call for papers will open March 1st. Our goal is to involve more OT clinicians from around the state in our annual conference, and to provide an attractive array of courses on topics to be used in the field by advanced practitioners. Volunteering at conference is a great way to get involved in FOTA, and we need more help on our conference team to create another great annual conference in 2018. In advocacy, our Governmental Affairs Co-Chairs, Kelly Uanino, and Sharon Rosenberg, together with our lobbying firm Corcoran & Johnston, are working hard to promote awareness of OT practice in Florida, and protect practitioners and consumers alike through their monitoring of legislation proposed during 2018 session of the Florida legislature, January 9th through March 9th. Kelly and Sharon organized another FOTA Hill Day on January 10th, 2018. The agenda for the day included a variety of interactions with legislators and their staff to inform them about the importance of OT practice, the benefit of OT to Floridians, and to address issues such as the proposed bill on Telehealth. We are reaching out to OTs in Florida with expertise in Telehealth to assist us in developing a strategy to address OT in Telehealth in the future. 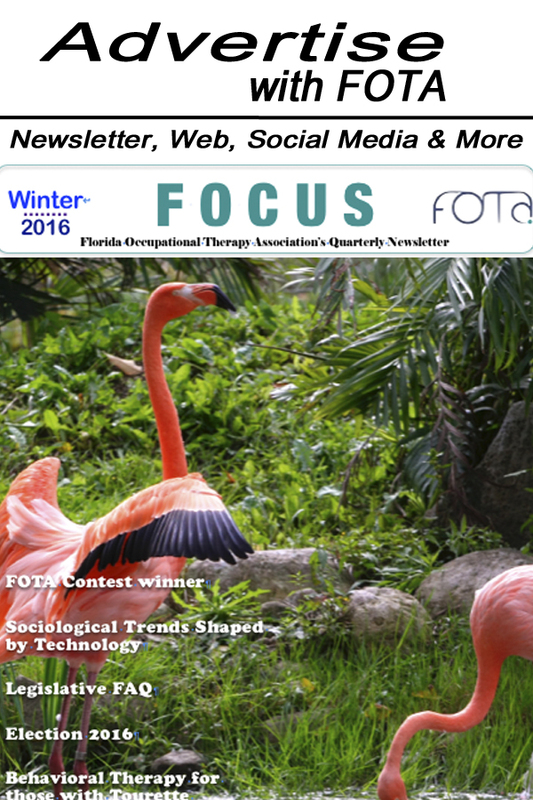 Other big goals for FOTA this year include building a larger group of members, especially OT and OTA clinicians. Our Membership Chair, Rachel Romero is developing a strategy to bring more OT practitioners into the organization, and provide greater value in membership to all. We are examining better ways to communicate and provide information and education through our website technology, e-mails, newsletters, and our social media platforms. Our Regional Reps are working hard to build FOTA at the more local and grassroots level by promoting FOTA membership and supporting local OT forums and networking in their communities. The Special Interest Sections Chairs are providing their subject area expertise to support the practice of our members and advise all advocacy efforts in our state. And the board is working on committees to review our strategic plan, financial plan, and update our policies, procedures, and bylaws. As President, my goal is to lead all these initiatives forward and provide structure and support for success in our endeavors. I hope to provide better outreach to all members so that they feel informed and included in our organization, and to encourage more and more involvement in the organization through a variety of communication platforms. I look forward to a busy and productive year.